Justin Fisher, Edward Fieldhouse, Mark N. Franklin, Rachel Gibson, Marta Cantijoch, Christopher Wlezien Eds. 2018. 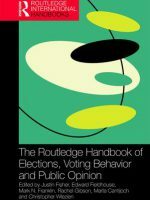 The Routledge Handbook of Elections, Voting Behavior and Public Opinion. New York: Routledge.